Butlers represent the pinnacle of guest care. Butlers have served as the stewards of a house for centuries. Specific dates vary—some trace butlers back as far as biblical times—but it’s agreed that the role originated from someone in charge of the alcohol (the most prized asset a house might have). As time passed, butler duties expanded, first in the Victorian era to include other traditional household responsibilities and then in later years to encompass just about anything. “The butler, in his heyday a century ago, managed large estates of perhaps as many as 400 staff inside and out, or might equally have looked after a single gentleman with no other assistance,” explains Steven Ferry, chairman of the International Institute of Modern Butlers. “[He] had to know protocol, firm management of staff, wines and table service, and, occasionally, also how to manage the valet position in smaller households …” But from the early to mid-20th century, social change led to the near extinction of the role. After years of decline, today butler service is back on the rise. The International Guild of Professional Butlers reports that there has been a steady increase of butlers the past 30 years with a surge during the past decade. The Guild estimates that there were 2 million or 3 million butlers worldwide in 2016, compared to around 1 million as recently as 2012. It seems that the years of experience would certainly help butlers meet the lengthy list of expectations that are applied to them. According to Ferry, today’s butlers are essentially expected to have all of the capabilities of their predecessors, plus the skills to manage modern technology such as house control, communication, entertainment or security systems. He or she might also be expected to have some understanding of human resources, law and taxes for managing personnel and property. Wennekes adds that for private households, the role of butler has evolved into sort of an “executive manager” position. In some situations private butlers may even manage childcare, and depending on their experience and background, Ferry says that butlers may find that chef or even bodyguard skills may be called upon. Butlers became more prevalent in high-end hotels and resorts starting in the 1980s, when a hotel in India became the first in the world to offer 24-hour butler service. “Until butlers started to appear in hotels … hotels had limited services they could offer guests, and little opportunity for personal interaction,” Ferry says. “Butlers in hotels opened up the possibilities of personalized, personable, and solicitous service, and extra services that would normally only exist in private service. It opened up the prospect of building a guest profile so that preferences could be provided without the guest asking for them.” The Lodge at Sea Island has employed 24-hour butlers since it opened in 2001, bringing a whole new meaning to Southern hospitality. The couple simply couldn’t leave home without their dog. It went with them everywhere as part of their family. But when they were visiting Sea Island recently and wanted to dine in the Forbes Five-Star Georgian Room to celebrate their wedding anniversary, they suddenly realized the pooch had put them in a predicament: Who would walk the dog at its usual time? Thankfully, Ron van Velzen was there. Van Velzen, who has been a butler at The Lodge since it opened, caught wind of the situation and kindly offered to add “dog walker” to his resume. While the guests enjoyed their gourmet meal, van Velzen and the dog walked laps around the property. The butler fed the dog, as well. And when the couple returned to their room, they found their beloved pet sleeping comfortably on its bed. 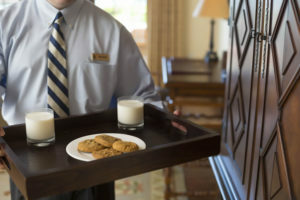 Butlers at The Lodge offer milk and cookies to guests at bedtime. For those particular guests on that night, van Velzen’s service seemed above-and-beyond—but for butlers at Sea Island, that sort of customer care is commonplace. 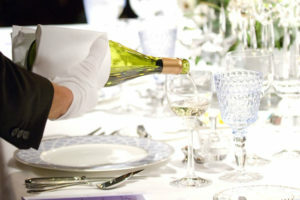 “… The mindset of a butler is to push beyond merely good service to that magical moment when the guest cannot help but say inwardly or outwardly, ‘Wow!’ and ‘How did he know?’ when receiving some service from his or her butler,” says Ferry, whose organization helped train the butlers at Sea Island. Once guests arrive, butlers field every request imaginable: They bring full ice buckets, fetch room service and make dinner reservations. If a gentleman needs a tie for a meal at the resort, the butlers offer a selection of Peter Millar options, which can be borrowed for the evening, and the butlers will even assist with tying it. Many of the Sea Island butlers have served at The Lodge since it opened, and those years of experience help keep them calm and ready for just about anything. The International Guild of Professional Butlers keeps track of statistics and trends about the butler profession. Here are a few notable numbers about the crème de la crème of the hospitality industry’s service workers. There are an estimated 2 million or 3 million butlers around the world in 2016, up from an estimated 1 million as recently as 2012. About 30 percent of all butlers are female, a number that has grown significantly in the last decade. Six is the maximum number of people a single butler can serve during a meal while still keeping the food hot. Many are not accustomed to serving themselves from a platter, and the delay causes the food to get cold. Most butlers stay in a given job for an average of six to eight years.